WHEN I saw the Cory Aquino Swatch, I thought it looked familiar. 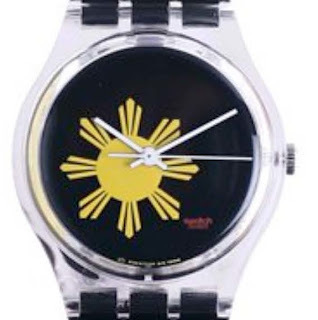 The Philippines Centennial Watch (1997) with a black strap (Photo from www.squiggly.com) The one of Cory Aquino's though just has fatter rays of the sun, but it's essentially the same design. Hmm...I wonder if Swatch/Gift Gate will sell me just a strap of the Cory Aquino Swatch as it never came out w/ a replacement strap for the RP Centennial edition. hehe. Yup, I still have the old watch courtesy of Ayala Corp. and since a few years ago, I had been wanting to resurrect it because suddenly patriotic stuff were back in fashion after Collezione C2 launched its RP map shirts. I'll probably be dropping by a Swatch store soon to make usyoso. Let me know if they would sell just the strap, I like to get one (or two) too.